As a participant in the Reader’s Favourite book review scheme, I had to select a book from among those that had been submitted for review. Nearly all of the books submitted are in electronic format. I prefer hard copies, so I selected the book I wanted to read and bought it on Amazon. The author is John Oliver who has a Batchelor’s degree in Political Science and Religious Studies from the University of California at Santa Barbara. He was working in Hawaii when he met John Provoo and decided to tell his story. The book is therefore an autobiography; as it is written in the first person. According to his ‘testimony’, John Provoo grew up in San Francisco, having been born in 1917. He was attracted to Buddhism and believed in the sanctity of all life. In March 1940, he went to Japan to study for the Buddhist priesthood. He returned to the US in May 1941 under the threat of imminent war, and enlisted in the US Army. He was sent to the Philippines where he worked as a clerk in Army headquarters in Manila. He was captured by the Japanese in the Battle of Corregidor and became a prisoner of war. Much of the book concerns his time as a Japanese prisoner. Because of his fluency in Japanese and his understanding of Japanese culture he often had to deal directly with his captors. This led simultaneously to somewhat more lenient treatment of fellow prisoners and suspicions by the same fellow prisoners that Provoo was giving aid and comfort to the enemy. When he returned to the US, he was accused of collaboration with the enemy, was acquitted and re-enlisted in 1946. For most of the next ten years, he was pursued by the US Justice Department for treason, and underwent several trials, during which his homosexuality was used against him. Eventually, he was acquitted and went to Japan to complete his Buddhist training and to Hawaii, where, as a high level Buddhist priest he lived the rest of his life, dying in 2001. One has the sense, in reading the book, of an honest re-counting of history, and, as such, it makes very interesting reading: in particular, the conflicted position in which a Japanese-speaking Provoo found himself as a Japanese prisoner of war; the shameful conduct of the Justice Department in mounting a hugely costly campaign against him and in using his homosexuality against him. It appears that John Oliver undertook a considerable amount of independent research to complete this book, and that he did not rely only on what Provoo told him. There are several areas that are worth mentioning. John Provoo was clearly a very complex character, but one does not get a full understanding of this complexity in the book. Rather, the emphasis is on the historic (what was done) rather than the psychological (why it was done). Might it have been a more interesting piece of literature if instead of being entirely in the first person, the author had intervened as the narrator now and then? In the latter part of the book, there is too much name dropping (who the various interested parties were), and on exactly what they said. I think it would have been sufficient to summarise the key points, and use footnotes where essential. While the writing is good and effective, there is very little description of the various environments in which Provoo found himself: again the emphasis on history rather than literature. 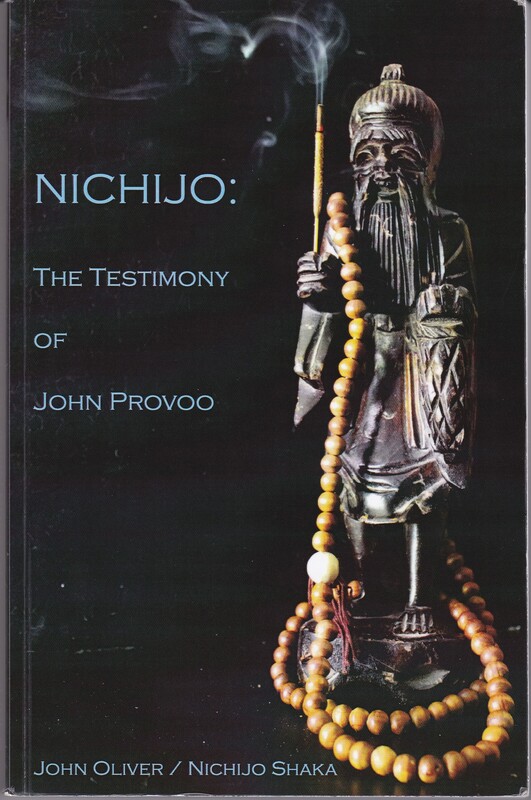 That said, Nichijo, (Provoo’s name as a Buddhist priest) is quite an interesting read. I enjoyed it.